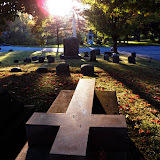 Well, here begins my previously posted about trips to Western New York cemeteries during October. I have been keeping up with the trips, although they haven't as quickly translated into posts. While originally this was conceived as a weekly posting, I believe that this week leading up to Halloween will be Cemetery Week at Ghost Upon the Floor, and I'll update with new cemeteries ever day or so. I think it best to start chronologically, and start with my several trips to Forest Lawn I've made in these last few weeks of October. 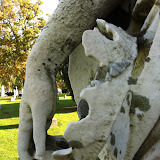 I photographed monuments, stones, angels, changing leaves and graves in what very well be my favorite cemetery. In the photo albums, which are more photo essays now, you will see things I've already photographed. Old friends such as the Pratt Monument and his angels make appearances, as do new statues and stones I discovered around the graveyard. While planting some deep fall colored mums in my recently discovered great-grandparents' urn in one of the cemetery's older sections, I discovered the grave pictured above, of Silas Henry Fish. Something just struck me about the way Silas' grave is constructed, on a shady hill, in his single, solitary above ground crypt. A huge cross lays on top of him, as opposed to the few stone flowers which adorn his wife's next to him. The first day of photography, as you can see above, I was there near sunset, and the sun setting shadows reminded me, for some reason, of the last act in Bram Stoker's "Dracula," as Jonathan Harker and company race the setting sun and the Prince of Darkness to his castle. When I returned a few days later for a series I will post later this week, I took several black and white photos of Silas Fish, and the stone work is even more striking and highlighted. I'm partial to the name Silas, too, I might mention, because of the character in Neil Gaiman's modern children's classic "The Graveyard Book." And this Silas lies on one of the most silent, peaceful hills in Forest Lawn. Always, I'm drawn back the short distance to the hill where the Pratt Monument stands. I took some shots of Pratt and his Angels in Autumn, and explored their section a bit more than before. Among the new stones I found were this pondering woman, who stands seated in a fenced in area among one of the older, circa 1900 areas of the graveyard. I'm ever fascinated by the artwork that lies within Forest Lawn. And however many times I visit the grounds, I always find some new beauty. I could spend hours among the stones, walking with my camera, finding and rediscovering new areas, art and the ways in which we remember those who have lived, and gone before us. I took far more photos than I have uploaded to the photo albums, but I tried to narrow the selection down to something I hope you, too, will find interesting-- a tour of the bright bursting orange autumn fall in this sprawling, magnificent cemetery.